What a great way to start 2017 with a little gem like Taqueria Arturo, the latest and much-needed facelift of Prince Arthur East. As much as we Montrealers are extremely spoiled with abundant choices of worldly cuisine, finding a good Mexican restaurant downtown has always been somewhat of a challenge. But Taqueria Arturo is much more than simply a restaurant, this place manages to balance tasty, quality food, ambiance and the best shot I’ve ever had: Mezcal served with orange slices topped with a smokey, child-pepper powder – an explosion of flavours – SÌ, SÌ, SÌÌÌ! 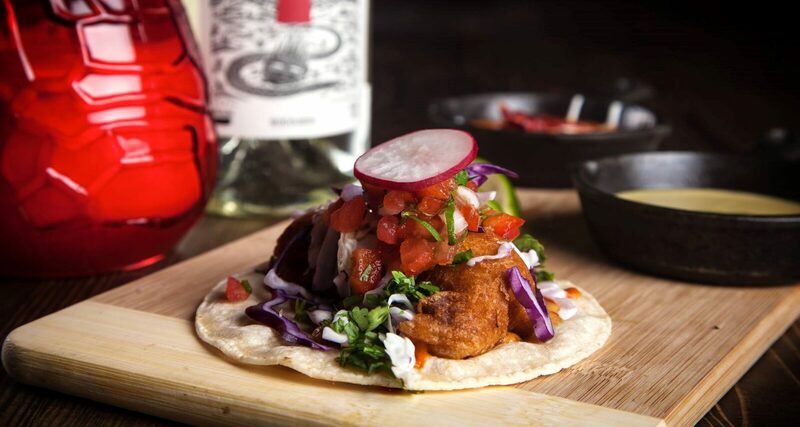 The menu holds the classic choices of tacos one would expect, such as the Crunchy Atlantic Cod. They also offer some new variations of traditional ones with an Asian kick, such as the “Peking Duck”: 5 spice roasted duck served on a corn tortilla, with pickled daikon and carrot with hoisin. All their tacos have a base of salsa roja, verde and habanero. Taqueria Arturo keeps it interesting with ingredients such as grilled kimchee, smoked housemade chorizo and even serving a taco with Greek tatziki yogurt. The most surprising taco, in my opinion, is the “Tuna Tostada” with Ahi Tuna Sashimi, chipotle aioli, crispy leeks, avocado on a crispy corn tortilla. For this specific reason, I believe this place will be an excellent gathering to bring your “picky eater” friends. Not to mention a date that might not have the same palette as yourself. Since their menu serves many different options from vegetarian to fusion, I see no reason why Taqueria Arturo wouldn’t become one of the popular places to go to before a night out on Saint Laurent Boulevard. The appetizer choices are custom Mexican, but since most of the ingredients are prepared in house and on the spot. The freshness is undoubtedly a winning formula – hence the guacamole is not to be missed. …my absolute favourite on the menu is classic – but ‘oh so delish’ when fresh and well made – “Baja Fish” with Crunchy Atlantic Cod, chipotle mayo, and cabbage. Still, it has me drooling. Amongst 9 different choices of burritos, this one is a sure bet for a home run. All burritos are wrapped in flour tortillas with black beans, cilantro, rice, pick de gallo, Queso Oaxaca and Mexican crema. We are usually used to black beans served as whole but Taqueria Arturo’s twist is that they are served already mashed into the mix of the burrito. It sure makes it easier to eat but as a presentation, it would maybe be the only minus I would point out. I leave this to personal preference…por què no? … with the many brands offered of Tequila and Mezcal – even extending the list with an organic tequila for those trying to keep it green. Being quite a picky cocktail person myself, usually, this is where I would be most harsh in my critic. But once again I was pleasantly surprised by the many fresh and new combinations of drinks offered. Such as the “Basil Limonada”: <a href=”https://www.bombaysapphire.com/en-gb/lda.aspx?redirect=default”>Bombay Sapphire</a>, lemon juice, Thai basil, cucumbers and chili bitters. Also noteworthy is the “Sotol Allonge”: HDC Sotol, coconut water, jasmine tea syrup, key lime splash and pink saline – making sure even the señoras will have a friendly buzz amongst the more harsher male alcohol beverages. Last but not least – what’s a place without ambiance and a genuinely smiling staff? Taqueria Arturo has both, which enhances the culinary experience to its best. But this place manages to do so with a laid back feel, keeping a high standard without any prejudice or snobbiness. A neon-lit Holy Marie tableaux to light the back room, while saintly “grave” candles make the ambiance of each table. This place is not only cozy with its wooden raw structures but has a touch of spiritual magic. Leaving you haunted to come back for more.